New Puppy Shopping List | We share our favorite products with you! You’ve added a new puppy to the family. But, there are so many tools, toys, and accessories to choose from. Where to start? After going through this myself just a few months ago, I’m going to share my personal favorites with you. Most are used with my own fur baby in my home right now. But, I’ve also included a few alternatives that come highly recommended as well. Disclaimer: This article contains Amazon affiliate links. Purchase through these links helps MomSkoop keep the lights on! 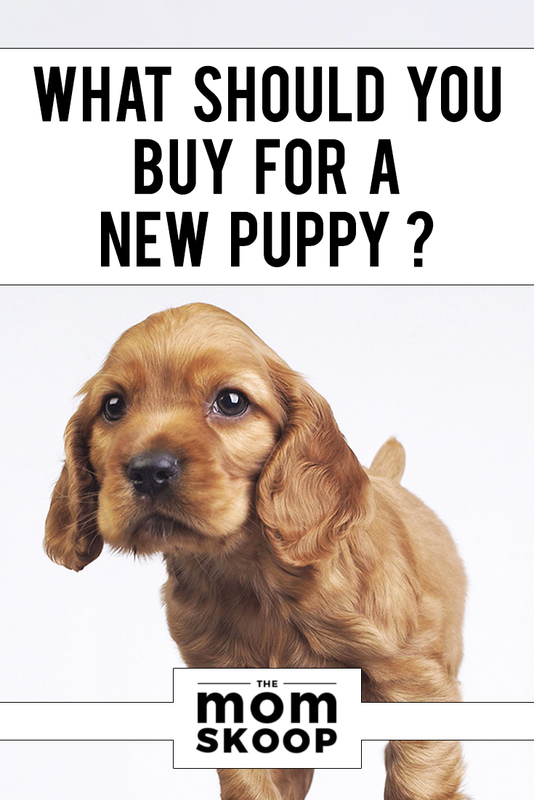 What should you buy for a new puppy? 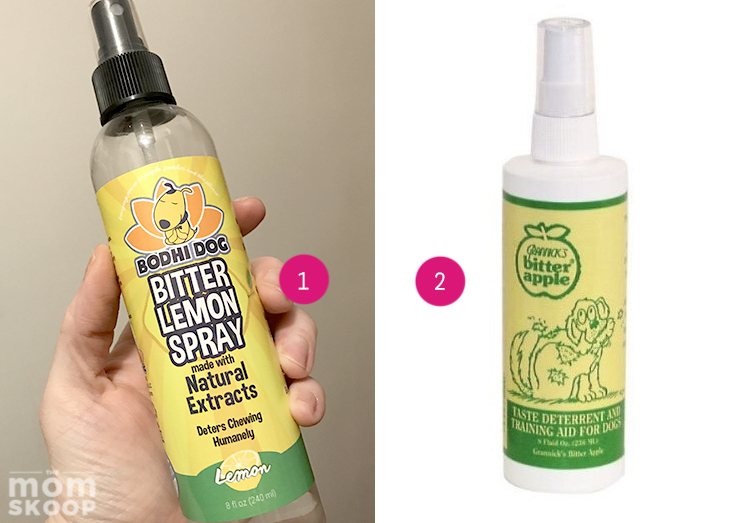 Do you have a favorite new puppy product? Let us know on Facebook! One of the biggest decisions you’ll make with your new puppy is where they will sleep. Most professionals recommend a puppy crate and pen for the best success. Crates and dog play pens provide valuable protection, training, and security for your new puppy. Having a controlled area can keep your puppy safe when you leave the house or are unable to be right next to them. It’s also a valuable tool in overnight potty training. 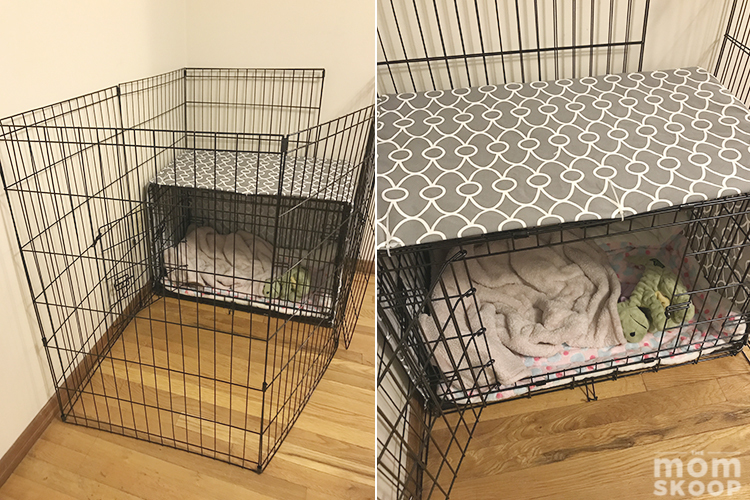 ➜ Tip: Use a crate cover to provide a buffer against light and noise so your puppy gets to sleep sooner and stays asleep longer. Check out How To Pick a Crate to see which kind and size is best for your new puppy. We’ve all pictured puppies running through the house playing, barking….. yeah, no. That just doesn’t happen in the real world. It can’t – for your dog’s own safety. 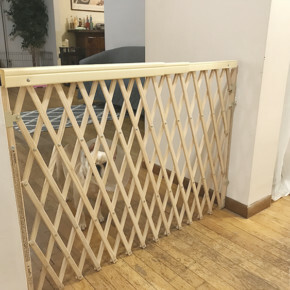 No matter if you live in an apartment or house, you’re going to need at least a few gates and fences to restrict your pooch to safe areas. But, there are a lot of puppy safety gates and fences. Which kind do you need? 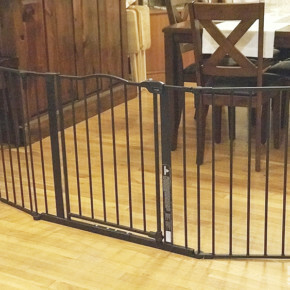 Size Varies – Make sure you measure the opening you need to block before ordering your pet gate or fence. You just love your new little furry bundle of joy. That is, until they chew up the leg of your favorite couch. UGH! It happens with even the cutest of dogs. Luckily there are sprays that help keep little teeth away from your prized possessions. I use Bitter Lemon at home, but I’ve also heard great things about Bitter Apple. Both operate the same way: they make stuff taste REALLY bad without using toxic chemicals. These sprays are doggy and furniture safe. You just spray areas where your dog has tried to chew (example: legs of your couch) and the bitter flavor should stop them from trying again. Puppy breath is so awesome! Puppy stink? Not so cute. Luckily, there are easy ways to keep things fresh between baths. Doggie Deodorant – This is a safe, easy way to freshen up your dog’s coat in between baths. We love the Eucalyptus & Spearmint spray from WAHL. ➜ TIP: Keep any spray away from puppy eyes, mouth, and ears. For safest application: spray onto your hand and then rub into puppy’s fur. Household Deodorizer – Unless you have an older dog and you are completely aware of any allergies they have, I recommend avoiding the powders you place on your carpet. Instead, opt for a light aerosol or fabric refresher. 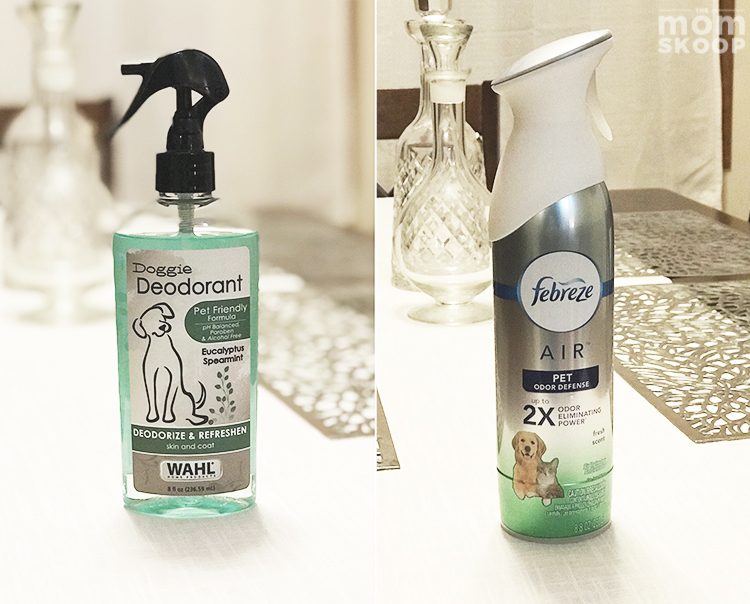 ➜ TIP: Spritz your room deodorizer in areas your puppy can’t reach. Examples: behind heavy furniture or on the back of throw pillows placed higher up on the couch. Poop happens. So does pee. A lot of it. You don’t have to worry about odor when you use a quality enzymatic cleaner. 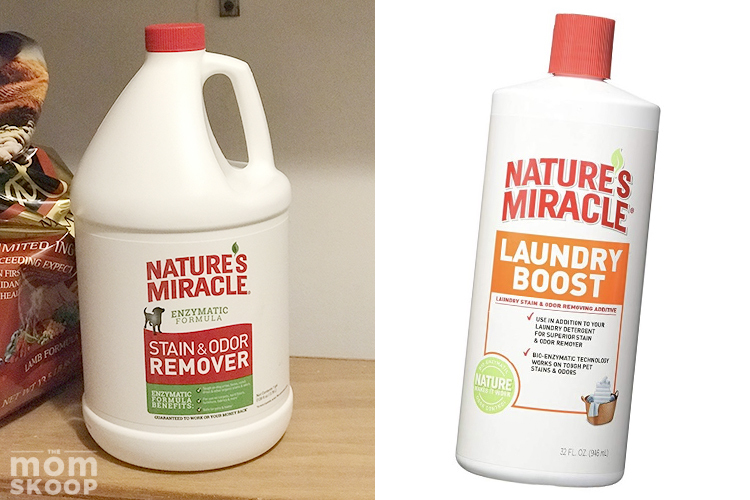 I can’t recommend Nature’s Miracle products enough. It’s a life saver and removes any scent no matter how big the mess. It can also be a great addition to your general spring cleaning supply list. Without active enzymes, they only mask pee and poop smells, still leaving odor residue for your dog to find. If your puppy can smell where they went last time – they’ll try to go there again. Most household cleaners contain toxic chemicals that can make your dog ill. Your puppy with probably spend more time in the family living room than any other area of the house. Make sure you have the accessories to make it both fun and functional. New puppies bring out the urge to BUY ALL THE STUFF! Toys, outfits, bones, ropes, and more. Soon, your living room is going to be a puppy toy wonderland. That’s great when it’s playtime, but what about when you have guests or just want to clean up? Time for some storage options! 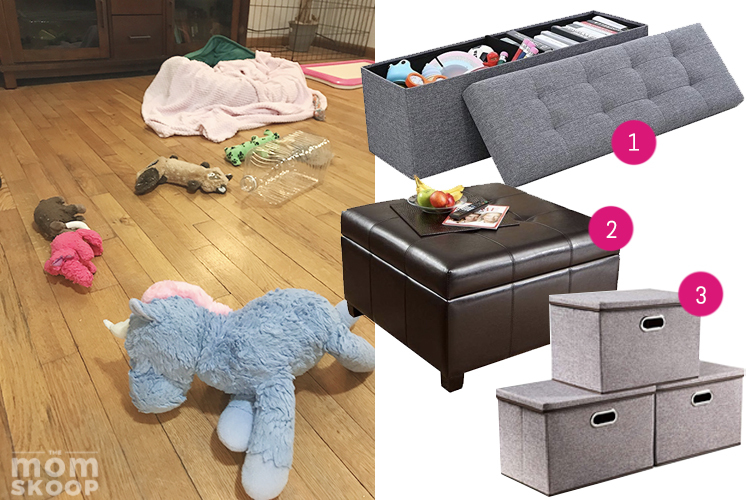 Most storage bins are dual purpose, so you can store your toys in a footstool, bench, or even a coffee table. If you simply want everything out of the way, then collapsible bins may be the way to go. No matter which style you choose, you’ll be able to quickly hide all of your pup’s items any time you wish. No matter how big your dog will eventually get, all puppies start out the same way: adorably small. 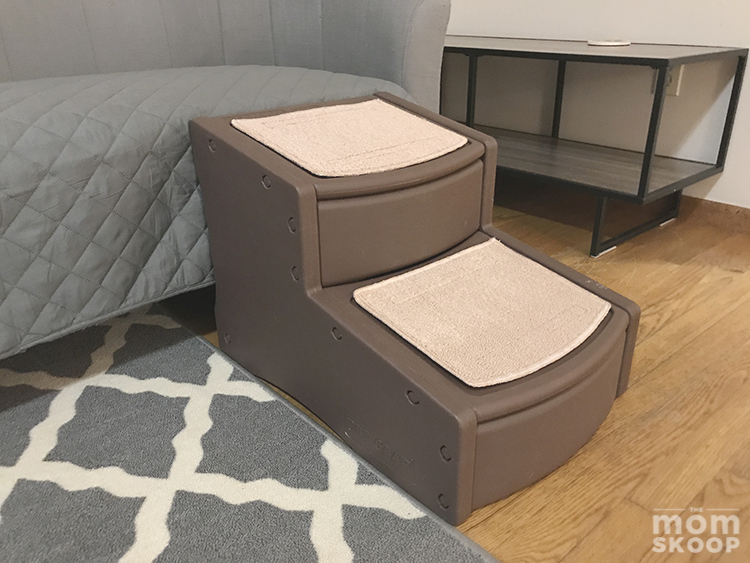 If you plan to let your puppy have access to snuggles on the couch (or bed) then it’s worth the investment to purchase some pet steps. We use the hard plastic style (seen and linked above) because our dog can’t chew them. But, if your pooch is chew-free then you can also get lighter foam pet steps. Cords aren’t candy! But it’s going to be hard to convince your puppy. Don’t take any chances! 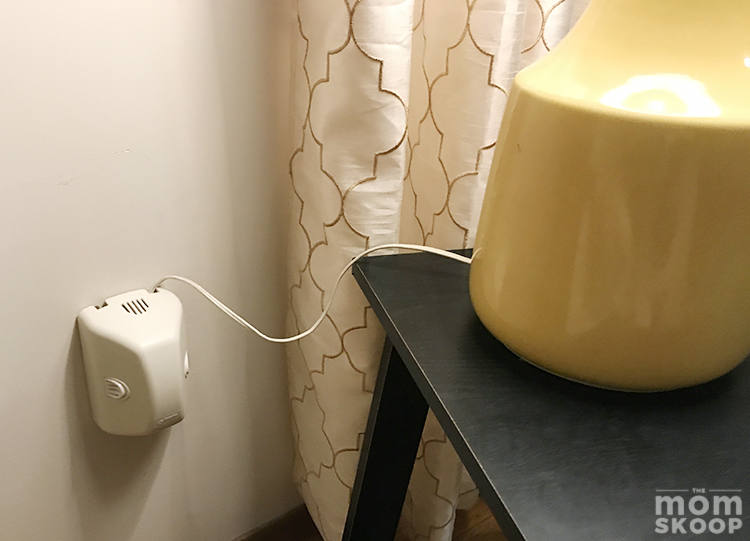 This complete outlet cover not only protects from licks and scratches while still being used, but it also provides a way to wind up long cords so they’re less tempting to chew on. 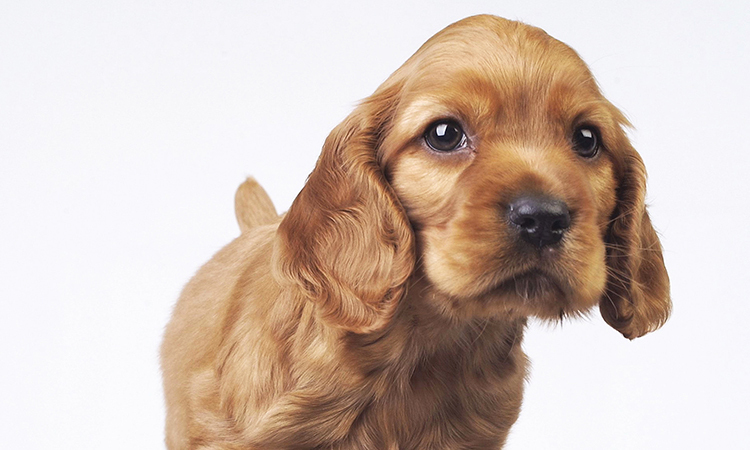 Puppy health and wellness is very important, but it doesn’t have to be complicated. Most serious medical areas will be handled by your veterinarian. However, there are a few health options you’ll need to also tackle at home. Farmer’s Medley from MilkBone – Available in 4 grain-free flavor combinations, these crunchy bones contain no fillers, no corn, and no artificial flavors or preservatives. Marrow Roasts from Wellness – Combining crunch on the outside and chewy marrow jerky on the inside, these treats contain all natural ingredients with no wheat, artificial colors, or artificial flavors. 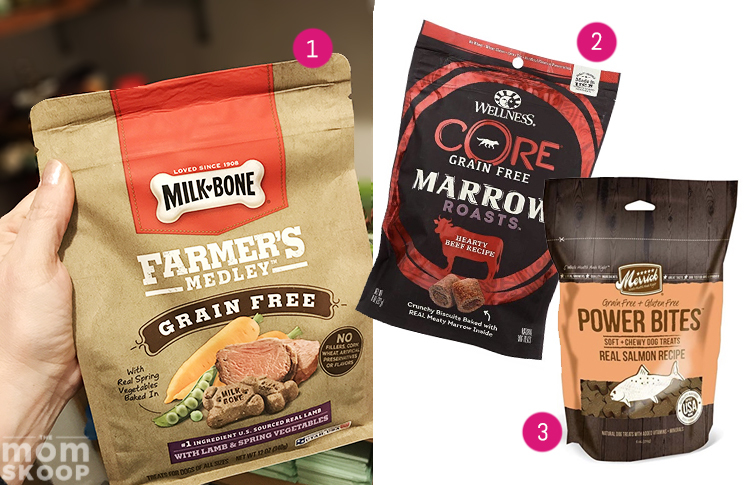 Power Bites from Merrick – Merrick, long a favorite for grain-free pet foods, offers 4 flavors in their Power Bites treat line. These chewy, all-natural bites are are grain and gluten free. We love the Salmon because fish is rarely a trigger for allergy-prone dogs. Luckily, most puppy vitamins are complete with all the essential nutrients. The main difference is how it’s delivered to your puppy. Canine Complete is our go-to for dog nutrition. We simply add the recommended teaspoons to her wet food each morning. If you’ll be feeding your dog a dry kibble, a chewable vitamin like Zesty Paws 5-in-1 would be perfect since it doesn’t have to be mixed with anything. 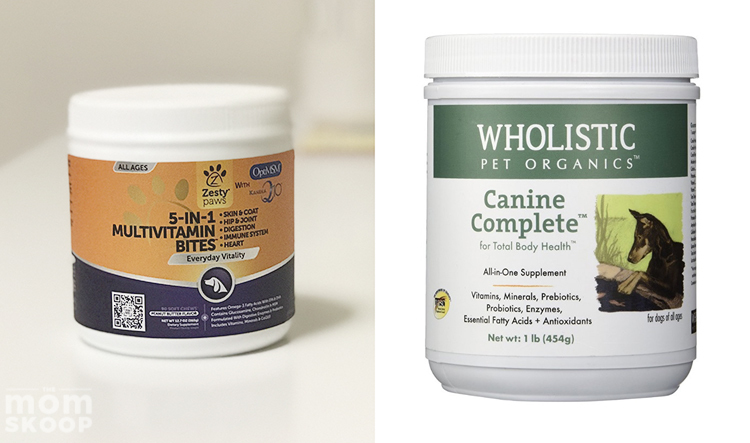 ➜ TIP: Avoid giving your dog human vitamins – even the children’s chewable kind. Dogs have different nutritional needs than humans AND some may even contain Xylitol which is poisonous to dogs. It’s never too early to start taking care of your puppy’s ears. There are different brands of puppy ear cleaner, but most belong in two categories: 1. daily maintenance use and 2. therapeutic use for existing inflammation or irritation. I recommend Pet Armor Ear Rinse for daily use. While wiping the outside of your puppy’s ears is also good, you have to clean the INSIDE. The only safe way to do that at home is with liquid drops. 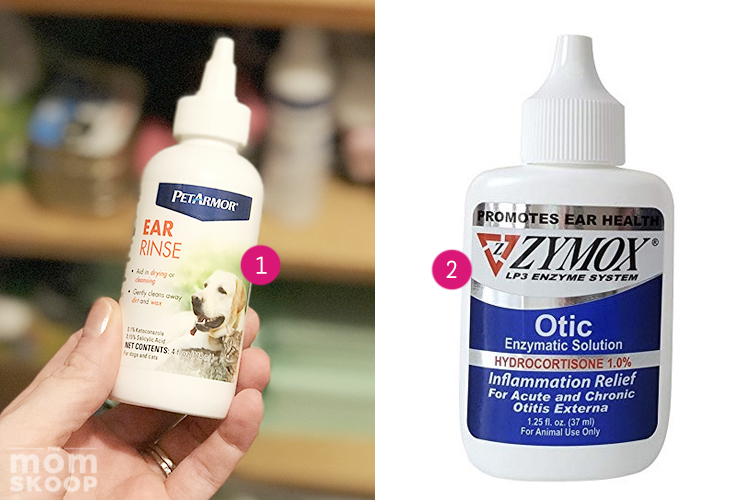 If your dog experiences itching or redness and inflammation, you may need an enzymatic drop like Zymox Otic. ➜ TIP: If your puppy exhibits signs of ear discomfort or irritation (itching, head shaking, redness, etc) always seek the advice of your veterinarian first. The symptoms may be from a more serious yeast infection that requires prescription medication. Potty training has to be the most talked about puppy topic. In all of the dog groups and forums I’ve wandered through, there is one question always present: How to I stop my puppy from peeing in the house?! Puppy potting training is no easy task. 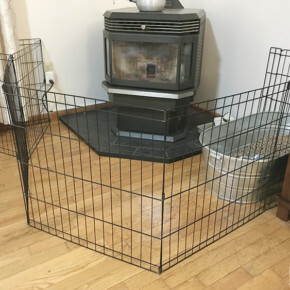 I’ll try to share an article with puppy potty training tips another time, but for now I’ll share my personal favorite training tool: the indoor puppy potty! Indoor potty trays can be a sanity saver, especially at night or when you have to be away from home for more than an hour or so. Unlike pad used alone, this tray covers the pad with a plastic mesh so that the puppy can’t reach what’s inside. No more pad chewing and ripping! If puppy makes a poop mess, simple unclip the tray and rinse under hot water. It takes only minutes. 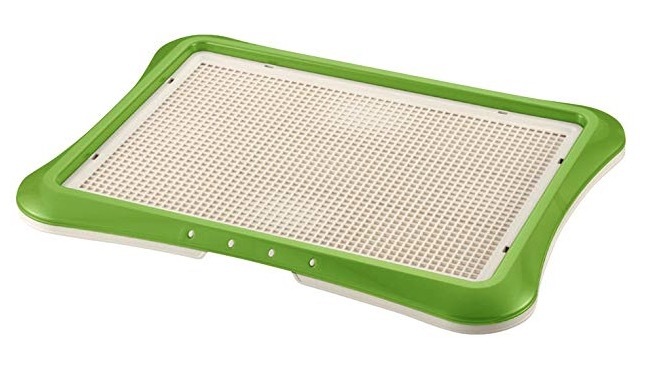 We recommend Thxpet 17.5″ training pads for this potty tray – they fit the rectangle shape of the tray perfectly! Your new dog will change your life forever. He or she will also rely on you for the rest of THEIR life. You want to make the right choices and pick the right products. We all do! Hopefully this list of our favorite new puppy products will at least give you a helping hand when it comes to picking what’s best for you and your new best friend. Would you like to share your favorite puppy products with our readers? Tell us on Facebook! “FROZEN 2” TEASER TRAILER & POSTER NOW AVAILABLE!